When the Spanish arrived on the west coast of South America in the 1500s, a large portion of the region was ruled by the powerful and sophisticated Inca Empire. The Empire had ruled much of the region since the early 1400s. The center of the Inca Empire was the city of Cusco. 2500 BC - Around this time people in the region began farming. They grew potatoes, corn, cotton, and other crops. They also started forming villages. 900 BC - The Chavin civilization begins to form in the northern Andes highlands. 850 BC - The Chavin build the city and temple of Chavin de Huantar. It is located around 160 miles north of where Lima, Peru is today. 700 BC - The Paracas civilization begins to form. 200 BC - The Chavin civilization collapses. 100 AD - The Nazca civilization begins to flourish. The Nazca are known for their complex textiles and ceramics. They are also famous for the Nazca Lines drawn in the desert floor. These lines form the shapes of large animals when viewed from the air. 200 AD - The Paracas civilization collapses. 600 AD - The Huari civilization begins to form in the area. 800 AD - The Nazca and Moche civilizations come to an end. 1000 AD - Many more cultures begin to form in the area during this time including the Chimu. 1200 AD - The Chimu build their capital city Chan Chan. 1200 AD - The Inca tribe, led by Manco Capac, founded the city of Cuzco in the Cuzco Valley region. 1200 AD to 1400 AD - The Inca live in and around the city-state of Cuzco. During this period of time they do not try to expand their area of control. 1438 AD - Pachacuti Inca Yupanqui becomes the leader of the Inca. He begins to conquer nearby tribes and expand the control of the Inca Empire. He reorganizes the government into the Tawantinsuyu and builds the city of Machu Picchu. 1471 AD - Tupac Inca Yupanqui, Pachacuti's son, becomes emperor. He will greatly expand the Inca Empire. 1476 AD - Emperor Tupac defeats the Chuma Empire and their lands become part of the Inca Empire. 1493 AD - Huayna Capac, Tupac's son, becomes emperor. The Inca Empire will reach its peak under the reign of Huayna Capac. 1525 AD - Emperor Huayna Capac dies from a plague. This was likely smallpox brought by the Spanish conquistadors. A large portion of the Inca population will die from smallpox and other diseases over the next several years. 1525 AD - The sons of Emperor Huayna, Atahualpa and Huascar, fight over the crown. The Inca Empire fights a civil war for the next five years. 1532 AD - Atahualpa defeats Huascar and becomes the emperor. 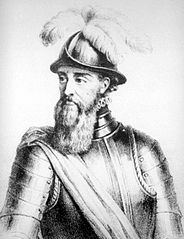 At the same time, Spanish conquistador Francisco Pizarro arrives in Peru. Pizarro captures Atahualpa and holds him for ransom. 1533 AD - The Spanish execute Atahualpa and install Manco Inca as Emperor. 1535 AD - Francisco Pizarro founds the city of Lima, Peru and names it the capital of the region. 1537 AD - Manco Inca flees to Vilcabamba and forms an Inca government separate from the Spanish. 1541 AD - Francisco Pizarro is killed. 1572 AD - The Spanish execute the last of the Inca emperors, Tupac Amaru, signaling the end of the Inca Empire. One of the most important aspects of the Inca daily life was the ayllu. The ayllu was a group of families that worked a portion of land together. They shared most of their belongings with each other just like a larger family. Everyone in the Inca Empire was a member of an ayllu. Once a person was born into an ayllu, they remained part of that ayllu their entire life. The daily life of a peasant in the Inca Empire was full of hard work. The only time peasants were allowed not to work was during religious festivals. Other than that, they were expected to be working when they were not sleeping. Most of the peasant men worked as farmers. They didn't own their own farms, but worked land owned by the government. They also had to pay taxes to the government. The women worked hard at the home during the day. They cooked, made clothes, and took care of the children. Most girls were married by the time they were twelve years old. The Inca nobles lived a much easier lifestyle. They still had to work, but had important jobs in the government. They could own land and didn't have to pay taxes. The men wore long sleeveless shirts or tunics. The women wore long dresses. Both men and women would wear capes or ponchos to keep them warm during the winter. The peasants and the nobles wore similar fashions. Of course the clothing of the rich was made from finer cloth and was more decorated. Hairstyles were an important part of Inca fashion. The type of hairstyle you wore told people your social status as well as what group, or ayllu, you were from. In what kind of houses did they live? Most of the people lived in adobe brick homes with thatched roofs. The homes were mostly single story with one room. There was typically very little furniture in the homes, just some baskets for storing things, thin mats to sleep on, and a stove. What people ate depended a lot on where they lived. Corn, squash, and beans were the main staples of their diet, but they ate other things as well including tomatoes, peppers, fish, and ducks. In general, the people ate well and were taken care of. If someone couldn't work or was too old to work on the fields, the government took care of them and made sure they had enough food. Only the wealthy children went to school. Peasant children began to work when they were still young and only learned the craft or skill that would be their job for the rest of their lives. Children were not watched over like they are in most societies today. They were left alone throughout the day. Parents didn't hug or coddle their children. The mother would feed and clean the child, and then leave it to itself. Many men carried a small bag around with them, almost like a purse. In this bag they kept coca leaves for chewing as well as good luck charms. Starting at the age of 14, men of the nobility wore large gold earplugs. They would put in bigger and bigger plugs over time. Many people had to pay their taxes through labor. They worked for the government as soldiers, builders, or farmers in order to pay their taxes. The government had inspectors that would keep an eye on the commoners. They even checked to see if the people were keeping their house clean and tidy. Most commoners were not allowed to travel within the empire. Only the rich and government officials were allowed to travel. When the Spanish arrived in Peru in the 1500s the Inca Empire was huge. It stretched for over 2000 miles from the north to the south and had a population of an estimated 10 million people. The Inca needed a sophisticated and organized government to maintain an empire this large. The Inca government was called the Tawantinsuyu. It was a monarchy ruled by a single leader called the Sapa Inca. Sapa Inca - The emperor or king of the Inca Empire was called the Sapa Inca, which means "sole ruler". He was the most powerful person in the land and everyone else reported to the Sapa Inca. His principal wife, the queen, was called the coya. Below the Sapa Inca were several officers who helped to rule the empire. High ranking officials were often relatives of the emperor and were always part of the Inca class. Viceroy - Below the Sapa Inca was the viceroy, or Inkap Rantin. He was a close relative of the Sapa Inca and worked as his closest advisor. High Priest - The high priest, called the "Willaq Umu", was also a very powerful man. He was probably second in power to the Sapa Inca due to the importance of religion in the Inca Empire. Governors of a Quarter - The Inca Empire was divided up into four quarters. Each of these quarters was ruled by a governor called an Apu. Council of the Realm - The Sapa Inca also kept a council of men who advised him on major matters. These men were powerful nobles. Inspectors - In order to maintain control and to make sure people were paying their taxes and following the ways of the Inca, the Sapa Inca had inspectors that watched over the people. The inspectors were called "tokoyrikoq". Military Generals - There were also military generals. The head general was usually a close relative of the Sapa Inca. These leaders were called "Apukuna". Other Officials - There were many other government officials and leaders throughout the Inca Empire such as priests, military officers, judges, and tax collectors. The Empire was divided up into quarters called "suyu". The four suyu were Chinchay Suyu, Anti Suyu, Qulla Suyu, and Kunti Suyu. At the center of the four quarters was the capital city of Cuzco. Each suyu was then further divided into provinces called "wamani". A lot of times each wamani was made up of a tribe that had been conquered by the Inca. There were also smaller divisions within each wamani. The smallest, and maybe the most important, division of government was the ayllu. The ayllu was made up of a number of families and often acted like a large family. The ayllu was responsible for paying taxes. Also, land was assigned by the government to each ayllu based on the number of people in the group. In order to run the government, the Inca needed food and resources which they acquired through taxes. Each ayllu was responsible for paying taxes to the government. The Inca had tax inspectors that watched over the people to make sure that they paid all their taxes. There were two main taxes that the people had to pay. The first tax was a portion of the ayllu's crops. The crops were divided up three ways with the first third going to the government, the second third to the priests, and the final third was for the people. The second type of tax was called the mit'a. The mit'a was a labor tax that each man between the ages of 16 and 60 had to pay by working for the government for a portion of the year. They worked various jobs such as laborers on government buildings and roads, mining for gold, or even as warriors in the army. The laws were made by the Sapa Inca and passed down to the people through the tax collectors. Murder, stealing, cheating on taxes, and cursing the gods was all against the law. However, there wasn't a lot of crime in the Inca Empire, mostly because the punishments were very harsh. For example, people were often executed for cursing the gods. If they were caught stealing, they would have their hands cut off. Every ayllu had its own tax collector. Although the Inca had a road system between the cities, commoners were not allowed to travel on the roads. The roads were guarded by the army and trespassers were usually killed. The name for the inspectors "tokoyrikoq" is translated as "he who sees all". Most conquered tribes were allowed to remain in their homelands. However, if they were considered rebellious, they would be moved to other areas of the empire. The Inca roads were an important part of the Inca government as they were used for communication. The religion of the Inca was closely tied into the everyday life of the Inca as well as with their government. They believed that their ruler, the Inca Sapa, was part god himself. The Inca believed that their gods occupied three different realms: 1) the sky or Hanan Pacha, 2) the inner earth or Uku Pacha, and 3) the outer earth or Cay pacha. Inti - Inti was the most important of the gods to the Inca. He was the god of the sun. The emperor, or Inca Sapa, was said to be a descendent of Inti. Inti was married to the Goddess of the Moon, Mama Quilla. Mama Quilla - Mama Quilla was the goddess of the Moon. She was also the goddess of marriage and the defender of women. 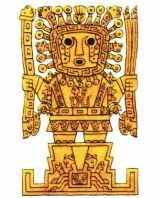 Mama Quilla was married to Inti the god of the Sun. The Inca believed that lunar eclipses occurred when Mama Quilla was being attacked by an animal. Pachamama - Pachamama was the goddess of Earth or "Mother Earth". She was responsible for farming and the harvest. Viracocha - Viracocha was the first god who created the Earth, the sky, the other gods, and humans. Supay - Supay was the god of death and ruler of the Inca underworld called the Uca Pacha. The Inca built many beautiful temples to their gods. The most important temple was the Coricancha built in the heart of the city of Cuzco to the sun god, Inti. The walls and floors were covered with sheets of gold. There were also gold statues and a huge gold disc that represented Inti. Corichancha means "Golden Temple". The Inca believed strongly in an afterlife. They took great care in embalming and mummifying the bodies of the dead before burial. They brought gifts to the dead that they thought the dead could use in the afterlife. The Inca felt so strongly in the afterlife that when an emperor died, their body was mummified and left in their palace. They even kept some servants to watch over the dead emperor. For certain festivals, such as the Festival of the Dead, the dead emperors were paraded through the streets. The Inca believed that the heavens were divided into four quarters. If a person lived a good life they lived in the part of heaven with the sun where there was plenty of food and drink. If they lived a bad life they had to live in the underworld where it was cold and they only had rocks to eat. Huacas were sacred places or objects to the Inca. A huaca could be manmade or natural such as a rock, a statue, a cave, waterfall, mountain, or even a dead body. The Inca prayed and offered sacrifices to their huacas believing that they were inhabited by spirits that could help them. The most sacred huacas in the Inca Empire were the mummies of the dead emperors. They allowed the tribes they conquered to worship their own gods as long as the tribes agreed to worship the Inca gods as supreme. The Inca held religious festivals every month. Sometimes human sacrifice would be included as part of the ceremony. The Inca worshiped mountains and considered them sacred. This was because they believed the mountains were the source of water. The Spanish tore down the temple of Coricancha and built the Church of Santo Domingo at the same location. Priests were very important and powerful in Inca society. The High Priest lived in Cuzco and was often the brother of the emperor. The Inca Empire was a complex society with an estimated population of 10 million people. They had large stone cities, beautiful temples, an advanced government, a detailed tax system, and an intricate road system. The Inca, however, didn't have a lot of basic technologies we often consider important to advanced societies. They didn't use the wheel for transport, they didn't have a writing system for records, and they didn't even have iron for making tools. How did they create such an advanced Empire? Below are some of the important scientific innovations and technologies used by the Inca Empire. The Incas built a large system of roads that went throughout their empire. The roads were usually paved with stone. Stone steps were often built into steep areas in the mountains. They also built bridges where the roads needed to cross rivers. The main purpose for the roads was for communication, moving army troops, and to transport goods. Commoners were not allowed to travel on the roads. Communication was accomplished by runners on the roads. Fast young men called "chaskis" would run from one relay station to the next. At each station they would pass the message on to the next runner. 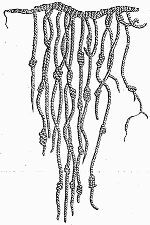 Messages were either passed verbally or by using a quipu (see below). Messages traveled quickly this way at the rate of around 250 miles per day. 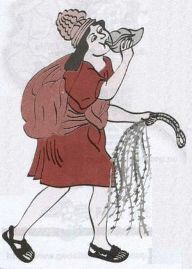 A quipu was a series of strings with knots. The number of knots, the size of the knots, and the distance between knots conveyed meaning to the Inca, sort of like writing. Only specially trained officials knew how to use quipus. 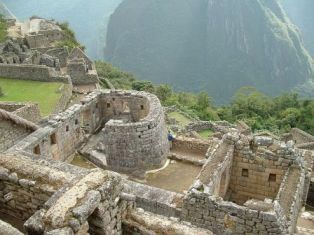 The Inca were able to create sturdy stone buildings. Without the use of iron tools they were able to shape large stones and have them fit together without the use of mortar. By fitting the stones closely as well as other architectural techniques, the Inca were able to create large stone buildings that survived for hundreds of years despite the many earthquakes that occur in Peru. The Inca were expert farmers. They used irrigation and water storage techniques to grow crops in all sorts of terrain from the deserts to the high mountains. Despite not having beasts of burden or iron tools, the Inca farmers were very efficient. The Inca used their calendar to mark religious festivals as well as the seasons so they could plant their crops at the correct time of the year. They studied the sun and the stars to calculate their calendar. The Inca calendar was made up of 12 months. Each month had three weeks of ten days each. When the calendar and the sun got off track, the Inca would add a day or two to bring them back into alignment. The Inca had a complex system of government and taxes. Numerous officials kept watch over the people and made sure that the taxes were paid. The people were required to work hard, but their basic needs were provided. The messengers who ran on the roads were punished harshly if the message was not accurately delivered. This rarely happened. The Inca built a variety of bridges including suspension bridges and pontoon bridges. One of the main forms of medicine used by the Inca was the coca leaf. The Inca developed aqueducts to bring fresh water into town. The basic unit of distance used by the Inca was one pace or a "thatki". The Inca society was based around strict social classes. Few people had the opportunity to improve their social status. Once a person was born into a social class, that was where they would remain for the rest of their life. The Inca Empire was ruled by the ancestors of the original Inca people. These were the people who originally established the city of Cuzco. Sapa Inca - The emperor or king was called the Sapa Inca. He was at the top of the Inca social class and was considered a god in many ways. Villac Umu - The high priest was just behind the Sapa Inca in social status. The gods were very important to the Inca and the high priest spoke directly to their most powerful god, the Sun god Inti. Royal Family - The direct relatives of Sapa Inca were next in line. They received high positions in the government. The primary wife of the emperor was the queen called the coya. Inca - The noble class, or Inca class, was made up of the people directly descended from the people who first established the city of Cuzco. They were called the Inca. They lived lives of luxury and held the best positions in the Inca government. Inca-by-privilege - As the empire grew, the emperor needed more people he could trust in high positions in the government. There weren't enough of the original Inca to rule. So a new class was created called Inca-by-privilege. These people were considered nobles, but not as high in class as the true Inca. Below the Inca or noble class was the class of public administrators. These people ran the government at the low level. Curacas - The Curacas were the leaders from the tribes that were conquered. They were often left as leaders of their tribes. They still had to report to the Inca, but if they remained loyal, they often kept their position. Tax collectors - Each group of families, or ayllu, had a tax collector who kept watch over them. He made sure that they paid all of their taxes. There was also a strict hierarchy of tax collectors. The higher levels kept an eye on the people below them. Record keepers - In order to track who had paid their taxes and where the supplies were stored, there were many record keepers in the government. Artisans - Artisans were commoners, but were also considered a higher social class than the farmers. They worked on crafts such as pottery or gold jewelry for the nobles. Farmers - At the bottom of the social class were the farmers. The farmers were also the largest and the most important class within the Inca Empire. Farmers worked long hard days and sent two-thirds of their crops to the government and the priests. The Inca Empire relied on the production of the farmers for its wealth and success. 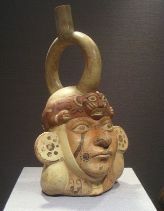 The basic unit of Inca society was the ayllu. The ayllu was made up of a number of families that worked together almost like one large family. Everyone in the empire was part of an ayllu. Craftspeople were paid by the government with food that the government received from the tax on farmers. Craftspeople also did not have to pay the labor tax called the mit'a. Architects and engineers were part of the public administration class. They were considered higher in class than artisans or craftsmen. Certain clothing and jewelry was reserved for the noble and Inca classes. Nobles and high level leaders, such as curacas, did not have to pay taxes. Nobles were allowed to have many wives, but commoners could only have one wife. Women married as young as twelve and were generally married by the age of 16. Men were married by the age of 20. Cuzco was the capital and birthplace of the Inca Empire. The emperor, or Sapa Inca, lived in a palace in Cuzco. His top leaders and closest advisors also lived there. Cuzco is located in the Andes Mountains of what is today southern Peru. It sits high in the mountains at an elevation of 11,100 feet (3,399 meters) above sea level. Cuzco was founded by Manco Capac around 1200 AD. He established the Kingdom of Cuzco as a city-state that ruled the surrounding lands. In 1438 Pachacuti became the Sapa Inca of the Inca people. He greatly expanded the lands that Cuzco controlled. Soon Cuzco was the center of the vast Inca Empire. Who lived in the city of Cuzco? The city of Cuzco was a place for nobles to live during the Inca Empire. Commoners did not live in the city. The only exceptions were the servants of the nobles as well as artisans and builders who were working on buildings or other items for the nobles. Many of the high ranking nobles were required to live in Cuzco. Even the governors of the four major regions of the empire were required to have a home in Cuzco and to live one fourth of the year in the city. The most important person that lived in Cuzco was the emperor, or Sapa Inca. He lived in a huge palace with his family and queen, the coya. Emperor's Palace - Perhaps the most important building in Cuzco was the emperor's palace. There were actually a number of palaces in Cuzco because each new emperor built his own palace. The palace of the previous emperor was occupied by his mummy. The Inca believed that the spirit of the old emperor inhabited the mummy and they often went to consult the mummies of previous emperors. Coricancha - The most important temple in Cuzco was the temple of the Sun god Inti. It was called the Coricancha which means "Golden Temple". During the time of the Inca Empire the walls and floors of the temple were covered in sheets of gold. Sacsayhuaman - Located on a steep hill on the outskirts of the city was the fortress of Sacsayhuaman. This fortress was guarded with a series of huge stone walls. There are individual stones in the walls so big they are estimated to weigh nearly 200 tons! A common greeting used in the city was "Ama Sua, Ama Quella, Ama Lulla" which meant "Don't lie, don't steal, don't be lazy". This was also the cornerstone of the Inca law. The Killke people lived in the area before the Inca and may have built some of the structures that the Inca used. The city of Cuzco is still a large city today with a population of around 350,000. 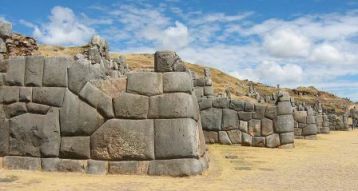 Many of the stones in the walls of Sacsayhuaman fit so closely together that you cannot even slide a piece of paper between them. The city of Cuzco is often spelled with an "s" as in Cusco. The Constitution of Peru officially designates the modern city of Cuzco as the Historical Capital of Peru. Spanish conquistador Francisco Pizarro said of Cuzco "it is so beautiful and has such fine buildings that it would be remarkable even in Spain". 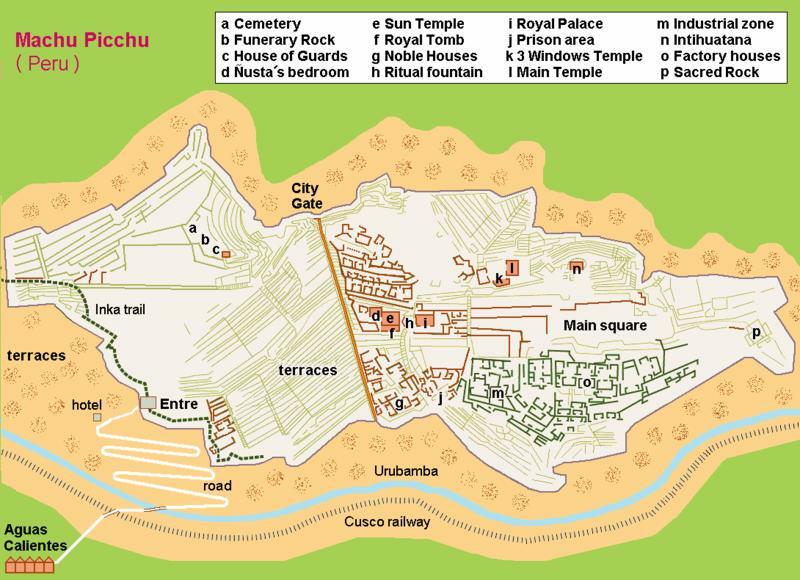 Machu Picchu was a city of the Inca Empire. It is sometimes called the "lost city" because the Spanish never discovered the city when they conquered the Inca in the 1500s. Today the city is a UNESCO World Heritage Site and was voted one of the New Seven Wonders of the World. One of the most fascinating things about Machu Picchu is its location. It sits 8,000 feet above sea level atop a mountain in the Andes Mountain range in southern Peru. Three sides of the city are surrounded by cliffs that drop over 1,400 feet to the Urubamba River. At the fourth side of the city is a high mountain. When was Machu Picchu built? Archeologists believe that the city was first built at the peak of the Inca Empire around the year 1450. Construction likely continued on the site until the empire was conquered by the Spanish in the mid 1500s. Machu Picchu was built as the royal estate for the ninth Inca King, Pachacuti. Archeologists aren't sure why he built it, however. There are a number of theories as to why he had it built. One theory is that it was a vacation retreat for the king. It is in a warmer spot than the capital city of Cuzco. It also is in a beautiful location and would have been a nice getaway for the king. Another theory is that it was built as a sacred religious site. Perhaps it was a combination of both theories. Most of the buildings are built with stones that are fitted together tightly without the use of mortar. This style of construction helped the buildings to stay intact during earthquakes. The Inca didn't use the wheel or have heavy beasts of burden, so most of the hard work was done by people. It would have taken hundreds of laborers using grass ropes and levers to move the large stones around the site. Machu Picchu was not a large city. Probably only around 1,000 people lived there. It was likely a city for the Inca nobility and priests as well as their servants. When was Machu Picchu rediscovered? The city was rediscovered in July 1911 by explorer Hiram Bingham. He was led there by a local boy named Pablito Alvarez. Hiram wrote a book about the city called The Lost City of the Incas. Sacred District - The Sacred District was home to many of the important temples including the Temple of the Sun and the Intihuatana. Popular District - This was where the commoners lived who served the nobles and priests. It has small houses and places for storing supplies. District of Priests and Nobility - This area had nicer homes where the priests and the nobility lived. One of the sacred structures found in Machu Picchu was the Intihuatana. This was a stone structure that the Inca believed helped to hold the sun in place and keep it on its correct path. These stones were once found throughout the Inca Empire, but most were destroyed by the Spanish. It is located around 50 miles from Cuzco, the capital city of the Inca Empire. Although we often think of Machu Picchu being high in the Andes Mountains, it is actually located about 3,300 feet below the city of Cuzco. Today it is the most visited tourist destination in Peru. Machu Picchu means "Old Peak" or "Old Mountain" in the Quechua language of the Inca. There are around 140 buildings in the city as well as over 100 flights of stone steps. 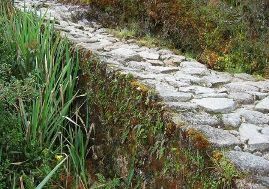 The Inca built a stone road from Cuzco to Machu Picchu. Many people still hike this trail today as part of their trip to see Machu Picchu. Before the Inca Empire took control of Peru and the west coast of South America, there were other tribes and civilizations that formed throughout the history of the region. The first civilization to form in the Americas was the Norte Chico civilization of northern Peru. It was one of only six civilizations to form separately in the ancient world. Archeologists think that around 30 major cities were part of the government formed by the Norte Chico including the capital city of Caral. The Norte Chico did not have ceramics, but built large monumental structures. The Chavin civilization reached its height around 500 BC. The Chavin lived in the Mosna Valley in the west central part of Peru. They are named after their most well-known site the Chavin de Huantar which was located high up in the Andes Mountains. The Chavin carved the images of their gods into huge blocks of stone. The Paracas civilization developed along the coast of Peru. They were skilled farmers who used advanced irrigation techniques to water their crops. 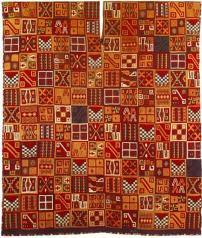 The Paracas are known for their tombs and well-preserved mummies as well as their complex textiles. The Nazca civilization was located along the southern coast of Peru. Their culture was heavily influenced by the Paracas civilization. The Nazca built underground aqueducts and were known for producing beautiful artwork and ceramics. Today the Nazca are most famous for their "Nazca lines". The Nazca made huge figures by carving long lines right into the ground of the dry plateau between the towns of Nazca and Palpa. You can still see these figures today when flying over the land in an airplane. Some of the figures are over 600 feet long! The figures include monkeys, spiders, trees, fish, and llamas. The Moche developed along the northern coast of Peru at the same time the Nazca were flourishing in the south. The center of the Moche civilization was Moche city. Moche city is known for two large structures, the Pyramid of the Sun and the Pyramid of the Moon. The Pyramid of the Sun was a huge structure made from over 130 million adobe bricks. The Moche people were also famous for their artistic pottery that was often made in the shape of animals and people. At the center of the Tiahuanaco civilization was a large city with an estimated population of 50,000 people. It was located high in the Andes Mountains at 12,000 feet above sea level. This city had a large temple complex with huge statues and a famous stone arch called the Gateway of the Sun. The Huari civilization developed to the north of the Tiahuanaco people and had much in common with them. The city of Huari was the center of the empire which had a central government as well as taxes. They also developed terraced farming in the mountains and had a well built road system. The Huari reached their peak around 800 AD, but something happened and they collapsed around 100 years later. No one is quite sure why the Huari disappeared. The Chimu Empire was the last well developed civilization prior to the rise of the Inca. They built their capital city Chan Chan around 1200 AD and expanded their empire to include much of Peru. They were conquered by the Inca in 1476 AD. The Norte Chico civilization was discovered in the late 1990s by archeologist Ruth Shady Solis. Sometimes the Huari is spelled "Wari". The capital city of the Chimu, Chan Chan, covered an area of around 10 square miles. When archeologists uncovered the Huari city of Pikillacta they found over 700 stone buildings. Some of the buildings were three stories tall. Most of the Moche pyramids were emptied by grave robbers, however archeologists found one intact. They found a mummy of a man who has since been nicknamed the Lord of Sipan. Where did Francisco Pizarro grow up? Francisco Pizarro grew up in Trujillo, Spain. His father, Gonzalo Pizarro, was a colonel in the Spanish army and his mother, Francisca, was a poor woman living in Trujillo. Francisco grew up with little education and never learned how to read or write. Growing up was tough for Francisco. He was raised by his grandparents because his parents never got married. He worked as a pig herder for many years. Francisco was an ambitious man, however, and wanted to improve his lot in life. He heard stories of the riches of the New World and wanted to travel there and find his own fortune. He set sail for the New World and lived on the island of Hispaniola for several years as a colonist. Pizarro eventually became friends with explorer Vasco Nunez de Balboa. In 1513, he joined Balboa on his expeditions. He was even a member of Balboa's famous expedition that crossed the Isthmus of Panama to reach the Pacific Ocean. When Balboa was replaced as the local governor by Pedrarias Davila, Pizarro became friends with Davila. When Davila and Balboa became enemies, Pizarro turned on Balboa and arrested him. Balboa was executed and Pizarro was rewarded for his loyalty to the governor. Pizarro had heard rumors of a land in South America that was full of gold and other treasures. He wanted to explore the land. He made two initial expeditions into the land. The first expedition took place in 1524 and was a total failure. Several of his men died and Pizarro had to turn back without discovering anything of value. The second trip in 1526 went better as Pizarro reached the Tumbez people on the borders of the Inca Empire. He now knew for sure that the gold he had heard tales of was more than just rumors. However, he eventually had to turn back before reaching the Inca. Pizarro now wanted to mount a third expedition. However, the local governor of Panama had lost confidence in Pizarro and refused to let him go. Very determined to mount another expedition, Pizarro travelled back to Spain to get the support of the king. Pizarro eventually received the support of the Spanish government for a third expedition. He was also named the governor of the territory. In 1532 Pizarro landed on the coast of South America. He established the first Spanish settlement in Peru called San Miguel de Piura. Meanwhile the Inca had just fought a civil war between two brothers, Atahualpa and Huascar. Their father the emperor had died and both wanted his throne. Atahualpa won the war, but the country was weakened from the internal battles. Many Inca were also sick from diseases brought by the Spanish such as smallpox. Pizarro and his men set out to meet with Atahualpa. Atahualpa felt he had nothing to worry about. Pizarro only had a few hundred men while he had tens of thousands. However, Pizarro set a trap for Atahualpa and took him prisoner. He held him ransom for a room full of gold and silver. The Inca delivered the gold and silver, but Pizarro executed Atahualpa anyway. Pizarro then marched to Cuzco and took over the city in 1533. He looted the city of its treasure. In 1535 he established the city of Lima as the new capital of Peru. He would rule as governor for the next ten years. In 1538 Pizarro had a dispute with his long time expedition partner and fellow conquistador Diego Almagro. He had Almagro killed. 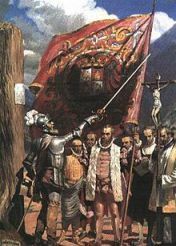 However, on June 26, 1541 some of Almagro's supporters led by his son stormed Pizarro's home in Lima and assassinated him. He was the second cousin once removed of Hernan Cortez, the conquistador who conquered the Aztecs in Mexico. No one is quite sure exactly when Pizarro was born. It was likely between 1471 and 1476. The famous explorer Hernando de Soto was part of Pizarro's group that conquered the Inca. Francisco was accompanied by his brothers Gonzalo, Hernando, and Juan throughout his campaign to conquer the Inca. When Pizarro captured the Inca Emperor his small force of less than 200 men managed to kill over 2,000 Inca and take 5,000 more as prisoners. He had the advantage of guns, cannons, horses, and iron weapons. Apu - One of four officials in charge of a quadrant, or suyu, of the Inca Empire. Each Apu was also part of the imperial council to the emperor. Ayllu - The basic unit of the community, an ayllu was made up of a number of families. Land was allotted to an ayllu based on the number of people in the group. Chaski - A runner who carried messages throughout the empire mostly for the emperor. The chaski ran between checkpoints on a vast network of roads passing on their message to the next runner. Messages were generally memorized and passed by mouth. Chimu - A powerful tribe in Peru that came to power around 900 AD. The Inca conquered them around 1470 AD. Conquistador - A Spanish military leader and explorer. The conquistadors were in search of new lands for Spain as well as treasure. Coya - The queen of the Inca Empire and primary wife of the Sapa Inca. Cuzco - The capital and birthplace of the Inca Empire. For the first several hundred years it was a city-state controlling just the immediate land around the city. It is still a major city in Peru today. Huaca - The huaca was a sacred object to the Inca that was inhabited by a spirit. It could be manmade or natural. Examples of huaca include stones, mountains, amulets, statues, and mummies. Huayna Capac - The eleventh emperor of the Inca, it was under his leadership that the Inca Empire reached its peak. He died from smallpox about the time the Spanish arrived. Inca - Within the Inca Empire the Inca were the people descended from the original founders of Cuzco. They were the nobility of the empire and lived lives of luxury. 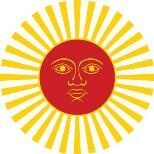 Inti - The Sun god and the most important god of the Inca. Intihuatana - A ritual stone associated with the sun and the Inca calendar. Manco Capac - The first Sapa Inca, Manco Capac founded the Kingdom of Cuzco. Machu Picchu - The "lost city" of the Inca that was never discovered and destroyed by the Spanish. Mit'a - A type of labor tax that each male citizen of the Inca Empire had to pay by doing labor for the government. This included such jobs as serving as a warrior in the army and working on temples or other government buildings. Pachacuti - The ninth Inca emperor, Pachacuti started the expansion of the Kingdom of Cuzco into the Inca Empire. He established the Tawantinsuyu. Peru - The modern country where Cuzco and the center of the Inca Empire was located. Pizarro - Francisco Pizarro was the Spanish conquistador who conquered the Inca. Quechua - The language spoken by the Inca. Quipu - A series of strings that recorded numbers and codes by using various sizes of knots. Sapa Inca - The leader and emperor of the Inca Empire. Suyu - A major division of the Inca Empire. The empire was divided up into four suyu each ruled by an apu. At the center of the four suyu was Cuzco. 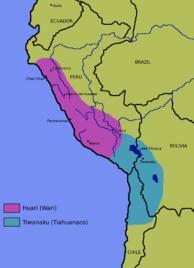 Tawantinsuyu - The Inca name for their empire. It mean the "Land of the Four Quarters". Thatki - A unit of measurement for distance equaling "one pace". Tokoyrikoq - The tokoyrikoq were inspectors who worked for the government. They made sure that all the rules were being followed by the people in the empire. Vilcabamba -The last refuge of the Inca Empire. When it fell to the Spanish in 1572, the Inca Empire was gone forever. Viracocha - The creator god of the Inca who made the Earth and was father to the Sun god Inti. Willaq Umu - The high priest of the Inca. Typically the brother or a close relative of the Sapa Inca.